I am no vegan. Really, I’m the farthest thing from it. I am meat obsessed. Pork, lamb, beef, you name it, I love it. But, every now and then I want to eat something that’s actually good for me that’ll leave my body feeling great afterwards. After moving to Greenwich Village I noticed a vegan sit-down restaurant just two blocks south of my apartment with a rather eye-catching name. 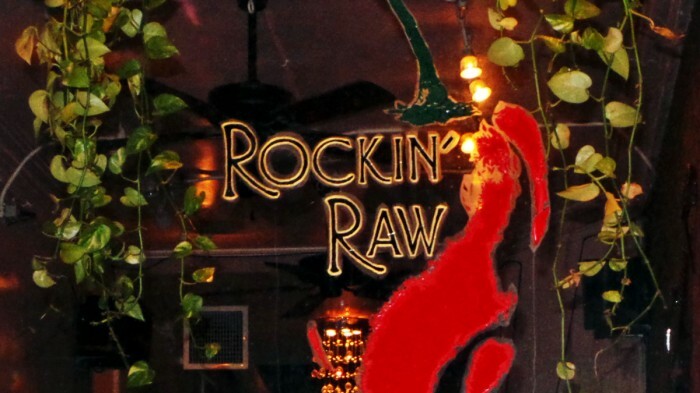 With a name like Rockin’ Raw, I wondered how rockin’ raw vegan food could be? You’ll be pleased to hear that I this food was actually some of the most flavorful, vibrant vegan food I’d ever tasted. One night when Amy and I wanted to eat healthy, we headed over to Rockin’ Raw for an uncharacteristic raw, vegan date night. 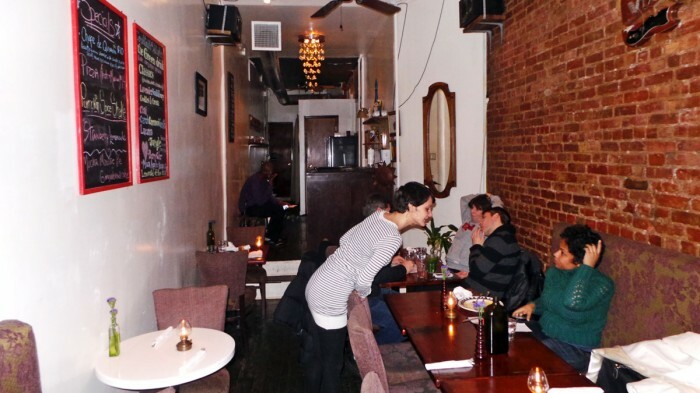 It’s a small, narrow, quiet, cozy restaurant with an excellent bluesy classic rock playlist to set the mood. Nearly the entire menu is organic, soy/gluten-free, raw, and vegan but still somehow manages to include exciting, delicious food with a Peruvian and New Orleans creole edge. I’ve found that most vegan places usually try to pull some sort of trickery, serving strange creations masquerading as meats. This really bothers me, so I’m really glad that Rockin’ Raw doesn’t try to pull any of that BS. By eating this food, you will not trick yourself into thinking it’s meat. You will be fully aware that it is vegetarian food, but you also won’t care because every dish is so interesting, flavorful, and highlights the fresh vegetarian ingredients. To start the meal, we decided to split Jalapeño Poppers. 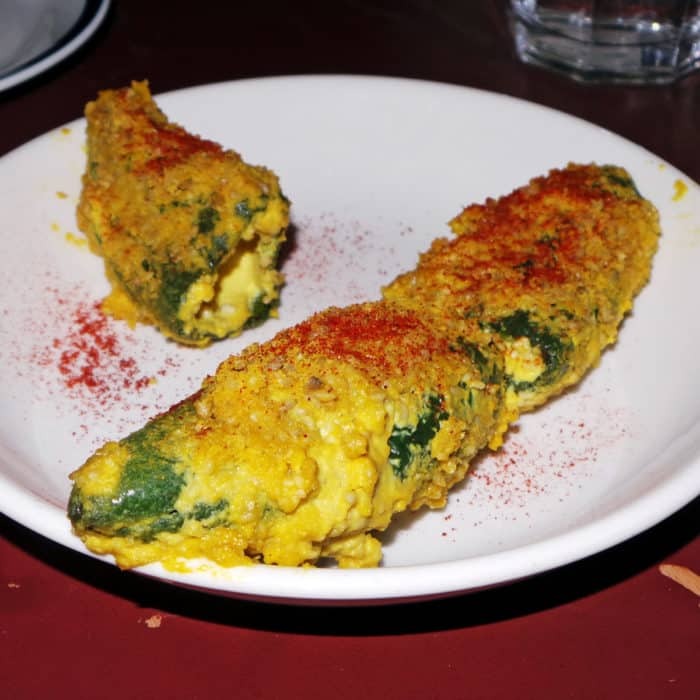 These were not your usual Jalapeño Poppers. They came out hot and melty, but did not have that thick, deep-fried breading I’m used to seeing. Instead there was a thin layer of something crumbly on top adding a bit of breadcrumb-like texture, but not a deep-fried crunch. Also, the peppers were served raw and uncooked which gave them a much snappier texture than I’m accustomed to. They were pretty spicy since the pepper’s natural heat hadn’t been tempered by any sort of cooking, but the filling did do a good job cooling and balancing the spice. Inside, there was a creamy filling they referred to as sunflower “cheddar” cheese. I wouldn’t say it necessarily tasted like cheddar cheese. Really it had more of a bean and nut-like flavor, kind of like a mixture of sunflower butter and hummus. It was definitely unusual, but I actually really liked it. For Amy’s main course she ordered the Tallarines Verdes de La Lala. The dish is also referred to as “live pasta” due to the fact that the pasta is actually long, thin strands of zucchini. 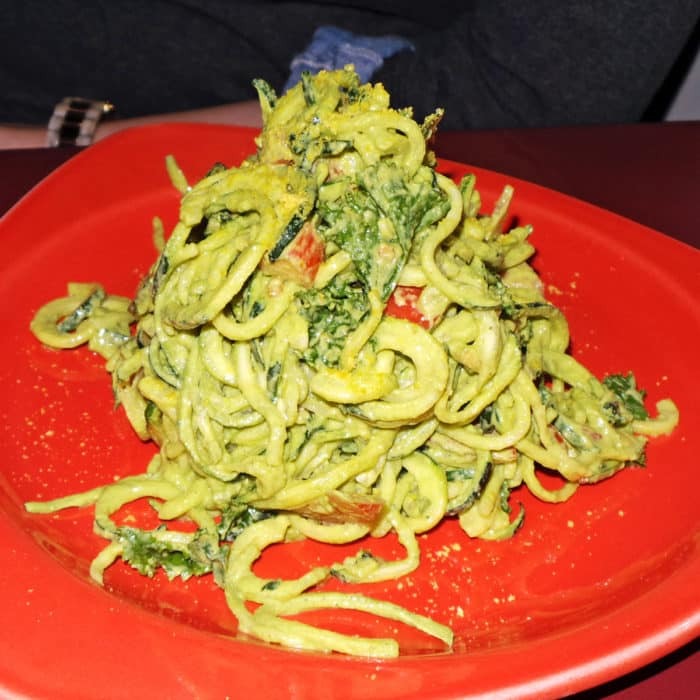 It was topped with fresh, diced tomato and ribbons of baby kale along with a Peruvian pesto sauce. The pesto was thin, almost runny, but was also still boldly basil flavored. This platter of “noodles” was so massive, flavorful, and satisfying that I didn’t even miss the pasta’s carbs. For my main, I chose the Cheezy Burrito. I know this sounds exactly like a dish you shouldn’t order at a raw, vegan restaurant, but our waitress told us it was her favorite dish, so I went for it anyway. When asked to choose between a side of cauliflower mash and chips, I decided to give their cauliflower a whirl. The dish actually ended up looking more like a wrap than a burrito, but that’s OK. 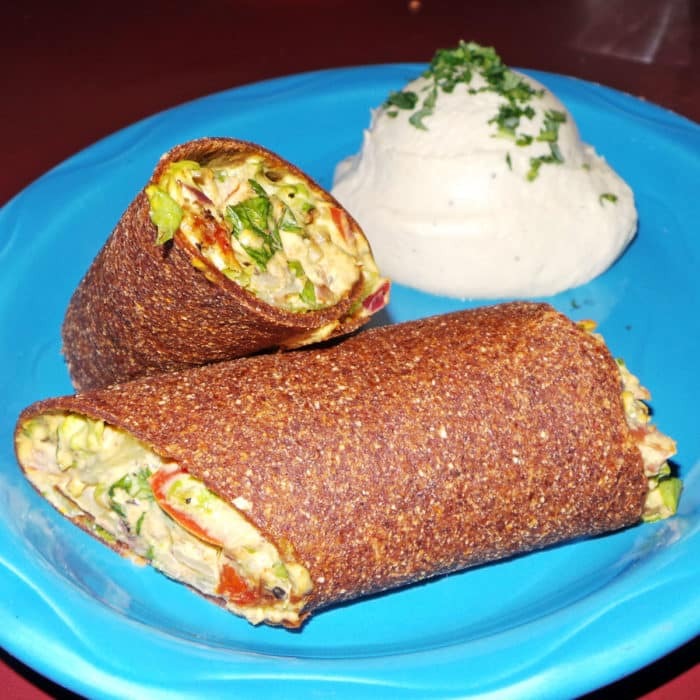 Inside of the dark red sun-dried tomato wrap was a creamy, flavorful mixture of mixed greens, salsa, guacamole, sour cream, nacho cheese, and something called seed meat. No, I have no idea what seed meat is, but I really don’t care because this thing was delicious and bursting with flavor. It was just a touch spicy and very creamy with a meaty mouthfeel. The tortilla’s texture was unusual, firmer than an ordinary flour tortilla, but the difference wasn’t unwelcomed. Seriously, every bite was bursting with bright, fresh flavors and I look forwards to having again soon. But let’s not forget about that cauliflower mash side. It was just as interesting as the Cheezy Burrito was. The cauliflower was beaten and whipped until it was extraordinarily light and fluffy with a mousse-like texture and strong citrus-forward flavor. Once again, this food was really different than what I expected but was still really delicious. 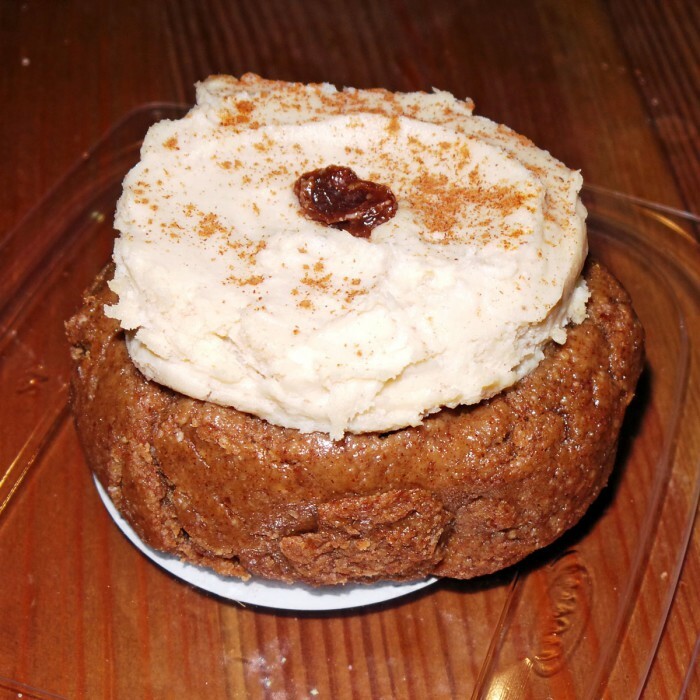 Though we really were full at this point in the meal, out of pure curiosity’s sake, we ordered one of their raw vegan desserts, the Cinnabun, to bring home. This is their raw, vegan riff on the classic mall favorite Cinnabon™. Well, if you’ve got a craving for a Cinnabon™, this dish probably won’t fill that void. Unfortunately, it looked a bit like a cow pie and was not remotely similar to a Cinnabon™ though it did actually taste pretty good. The frosting on top was light and creamy and had a buttercream-like flavor, but the pastry itself was very dense and had a paste-like mouthfeel similar to a tootsie roll. I haven’t had many good experiences with vegan sweets in the past and this was actually better than most, but I still probably won’t find myself craving another one any time soon. Although the menu might sound a little scary to non-vegans, I think this was actually some of the most interesting, flavorful, vibrant raw vegan food I’ve ever had the pleasure of eating. You won’t trick yourself into thinking it’s meat, but you’re not supposed to. It’s really just good, fresh food that highlights fresh, healthy, quality ingredients. Know of another vegan spot that’s actually delicious? Let me know in the comments below!